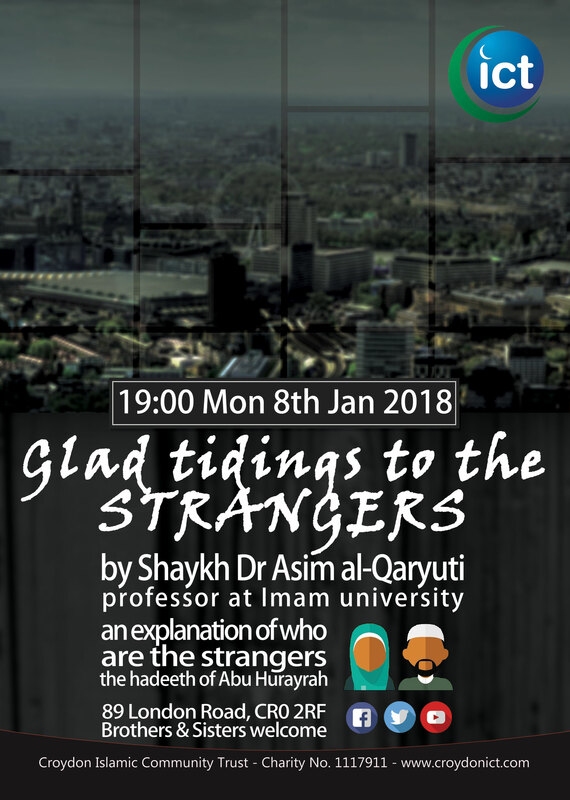 We are pleased to announce that we will be having Shaykh Dr. Asim bin Abdullah al-Qaryuti with us on Monday 8th January 2018 from 19:00 after Isha inshaAllah. The Shaykh was born in 1954. He comes from a Jordanian background. He has studied extensively and has specialised in ahadith. He had a strong personal relationship with Shaykh Muhammad al-Albani and also spent time studying with him. The Shaykh also travelled to Pakistan and studied with Ahl al-Hadith there, including the likes of Shaykh Badi ad-Deen ar-Rashidi. He gained his doctorate in 1983 and now teaches at Imam Muhammad University in Riyadh. 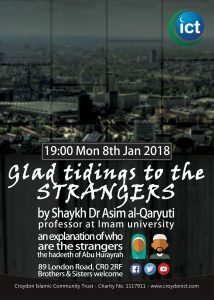 This entry was posted in Events, News, Seminars and tagged Ahlus Sunnah, As Salafiyah, Glad Tidings To The Strangers, hadith, Islam by Admin. Bookmark the permalink.